As five-time World Cup winners Brazil prepare to host next year's sporting showcase, one small island nation is still dreaming of a shot at the big time. With a population of about 11,200 and covering an area of only 26 square kilometres, Tuvalu is one of the world's smallest countries. Located in the South Pacific, the island, which gained independence from Britain in 1978, neighbours famous rugby nations such as Tonga and Samoa - yet football dominates the sporting landscape there. The importance of football to the country is evidenced by its 26-year campaign to become an official member of Fifa. Dutch football fan Paul Driessen first heard the story when Tuvalu's Prime Minister at the time, Apisai Ielemia, was part of a delegation that travelled to Fifa's Geneva headquarters in 2008 to express the country's wish to become a full member of world football's governing body. Driessen is a founding member of the Dutch Support Tuvalu Foundation. "Tuvalu have desired Fifa membership since 1987, but for several reasons they never made it to Fifa," he explained. "Part of this is paperwork. Paperwork comes with expertise and knowledge and that was something that Tuvalu was missing for many years. "I saw that Tuvalu wanted to become a Fifa member and, in the Netherlands, we have all the expertise to bring that country to the next level." The 1979 South Pacific Games was Tuvalu's first foray into international football - they reached the semi-finals. Tuvalu became the first non-Fifa member to compete in a World Cup qualifier during the 2007 Pacific Games. President of the Tuvalu Football Association visited Fifa in 2008 to discuss joining the governing body. Tuvalu beat American Samoa 4-0 to record their largest ever victory during the 2011 Pacific Games. A band of Dutch volunteers, consisting of a journalist, a marketing manager, a graphic designer and a social media expert, aim to raise the profile of Tuvalu's football dream. The national squad have just returned from a three-month training tour in the Netherlands organised by the foundation. This was the first time a nation from the Pacific - and one not affiliated with Fifa - had taken part in a European tour. Former NAC Breda and De Graafschap coach Leen Looijen was the team's mentor during their stay. 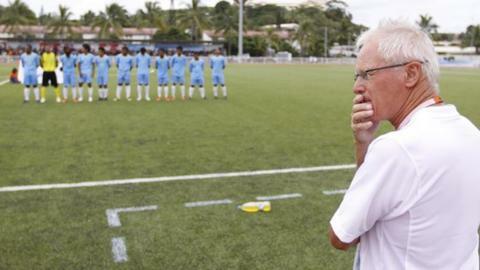 He followed former Dutch Under-21 coach Foppe de Haan, who was in charge of the Tuvalu squad during the 2011 Pacific Games. A lack of good facilities and funding are the major hurdles for Tuvalu. In addition to the sports ground, the island's airport runway doubles as a football pitch. As a result, there has never been a home international match on the island. Reverend Saoma Tafia, vice-president of the Tuvalu National Football Association (TNFA), explained: "You look at our ground, it's hard. Some of the players complain when it is raining. It's not good, but we have no other option, we have to carry on the games. "Our hope is to give our young people the chance to develop their skills. Our sport field is very poor and we don't have the money to develop, so our hope is, when we become a member of Fifa, we might have good facilities. "We want to educate our youths to become better players and ambassadors of Tuvalu and play in other countries in the world." Oceania Football Confederation (OFC) general secretary Tai Nicholas confirmed the lack of facilities in the country is a major obstacle to becoming a recognised member of Fifa. "The regulations state that members must have the infrastructure to host international football matches and tournaments and, since Tuvalu does not have a stadium, training grounds or hotels, this is the biggest hurdle for membership," advised Nicholas. As an associate member of the OFC, the Pacific Games provides the only opportunity for Tuvalu to compete on the international scene. The 2007 Pacific Games doubled as qualifiers for the 2010 World Cup, giving Tuvalu the distinction of being the only country in the world to have taken part in a World Cup qualifier despite not being a Fifa member. "The most important thing Tuvalu wants to have is international matches with other countries to show its identity," added Driessen. "It's an independent identity and that is something they should be allowed to express. It's as simple as that." The Dutchman is working with the TNFA to prepare a document that they hope to present at the Fifa world congress next year. But according to a Fifa spokesperson, the TNFA still have a great deal to achieve before acceptance into world football's governing body. "Fifa has provided Tuvalu with all of the information on the requirements to become a member," the spokesperson said. "Previous requests to Fifa by Tuvalu representatives some years ago did not include all of the required information and documentation, so the admission procedure was never properly fulfilled at that time. "The association was informed that any Fifa membership application procedure it wished to submit would have to be restarted." But the tiny nation remains resolute in its campaign and is hopeful that its 26-year wait to host an international match on the island will finally come to an end. Follow the progress on the Queen's Baton Relay as it makes the journey around the Commonwealth ahead of the Games in Glasgow in 2014.